Have you ever harvested and eaten fresh vegetables...in the middle of winter? This time of year, we prepare portions of the Children’s Garden for the cold weather by covering cool-weather crops with row-cover fabric and plastic. This material insulates our plants, keeping the air and soil up to 20 degrees warmer than surrounding areas, so our plants are protected from the harsh elements of winter. That way, we can offer kids the opportunity to do some harvesting in our Children’s Garden classes year-round. Our next session will begin on Saturday, January 21. While we won’t be spending all our time outdoors, we’ll definitely spend some of it harvesting the delicious veggies growing in our protected garden beds: carrots, turnips, beets, and greens, to name a few. In fact, due to the warmer-than-usual weather we’ve had over the past couple of months, we’ll even have the chance to explore the unprotected areas of the Children’s Garden, looking for veggies that have survived the cold without the benefit of cover. It feels wonderful to harvest fresh produce in the middle of January, but it’s also fun to explore other parts of the Garden: BBG is one of the most magical places to spend a winter day. The quiet beauty of the Garden is only heightened if there is a white snow cover. We will also visit the Tropical Pavilion and Aquatic House to remind us of the warm times to come, and we’ll use the education greenhouses to give kids the chance to interact with plants from around the world with science experiments and potting-up activities. We’ll also create beautiful terrariums and other plant-based crafts. Visit our Children’s Classes page for more info. And be on the lookout for our spring/summer 2012 brochure in print and online later this month. Registration begins on February 6 at 9 a.m.
Dave Daly is a former Children's Garden coordinator at BBG. 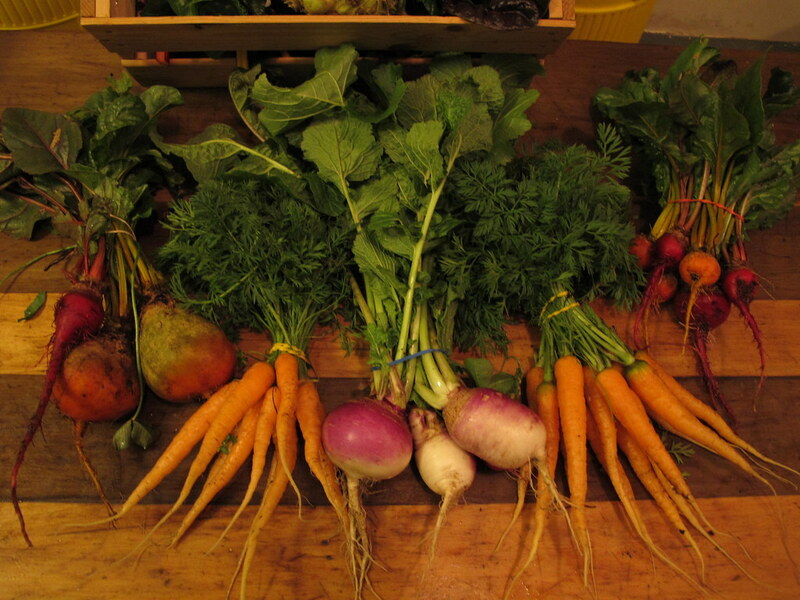 Root veggies can do quite well in the winter, as this December Children's Garden harvest shows. Photo by Dave Daly.